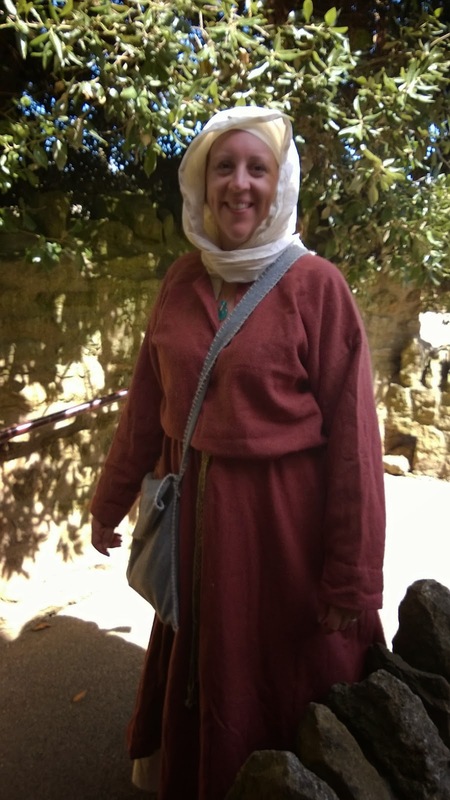 This weekend we were being Vikings at Abbotsbury Children's Farm in Dorset. The heavens opened as we set off, and the weather warnings made us wonder if we were doing the right thing, then ten minutes out of Abbotsbury the rain stopped so we could pitch our tent in the camping field without getting everything soaked. Abbotsbury is one of our favourite shows, but this is the first time we've attended as re-enactors. Last year we paid to get in and visited our friends as MOPs (members of the public). 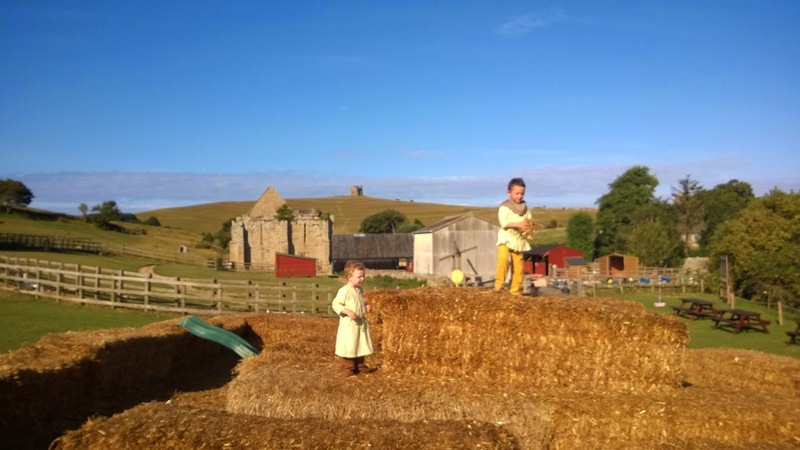 The children's farm is a fantastic place to visit even when there are no Vikings present, with pony rides and a petting corner, a huge play barn and lots to see on a small footprint of land so it's easy to keep track of little ones. Historically it's a really interesting site, with old monastic buildings and the massive tithe barn having been ruined and eventually re-purposed after the dissolution of the monasteries by Henry VIII. I spent most of the day demonstrating nalbinding socks for the kids while the boys defended their straw bale fort with the help of enthusiastic viking and MOP kids working together to repel the invading force of Matt. I really enjoyed listening to the talks given to the public on weapons, armour and clothing given by the hugely knowledgeable Chad the Grym who was positioned opposite me. Re-enactors are not just people dressed up in funny clothes, every one of them is a mine of information on different areas of history. Some are combat experts, others can tell you everything that is currently known about diet and cooking, and since most people make their own kit there are a lot of craft skills to learn from each other and from research. 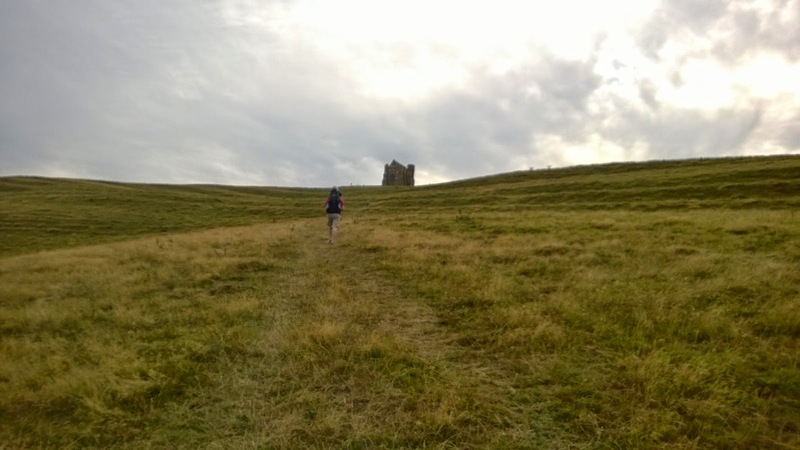 After a gloriously sunny day (and a cheeky ice cream in the cafe) we waved goodbye to the visitors and headed for an evening walk up to the atmospheric St Catherine's Chapel which sits on top of what looks like an iron age hill fort before heading back to our tent for the night. The storm then hit pretty hard, but we were snug in our tent and the rain stopped for an hour in the morning to let us pack up our tent and head off. Good times, good friends and a dry tent - what more could we want from a weekend.